People may see this page as "another recycled page from the NINternet's mighty past" but it is much more than that. The NINternet has seen a decline in participation over the years. At one time Nine Inch Nails sites were the largest group on the net. Since 1995 many pages have vanished, been taken down or have never been updated again. My mission is to take over this small part of what was started many years ago, and grow it to be the definitive site on the net for NIN from a live/touring perspective. I have spent years compiling, adding to, and proving this information before it being posted to the web. Alex Fletcher is the individual that started this list, I believe in 1994. Since that time many hands have gotten ahold of this information, but sadly, after the first push with Alex, Dave Parmenter, Willy McLachlan, Robbie Beasley, Brett Cruden, Matthew Dalby, Klint Finley, Todd Hawes, Doug Roark, sLaVe, and Mark Motter, the information became stagnant. The entire Fragility tour hadn't even been added. I have taken things a bit further. I have not only tried to find dates that NIN played, I am also looking for hard evidence that the show was played. In order of importance I have made notations on dates for such evidence. 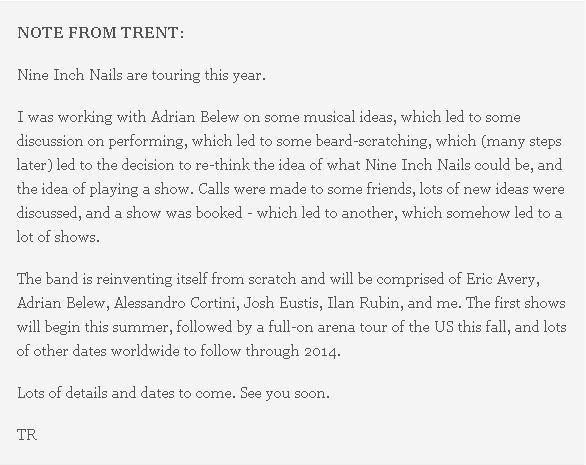 I believe that the most significant proof can come from a bands own Itinerary or NIN's official site (as the Fragility dates were confirmed.) Also any write-up in a newspaper. In any show review, the reporter always refers to the date, whether, buy stating "last night" or "Tuesday night" With the headline of the paper, the date is always present. Secondly, evidence from a Ticket or Ticket Stub, Show Poster, Handbill, Flyer, or off the Club's website that the band performed at. Thirdly, from a personal experience. I rank this last only because most people (without their stub) remember a vague month, or week they saw the band. As time progresses, details become a bit more fuzzy as to dates of shows. Salt Lake City, UT ? ?